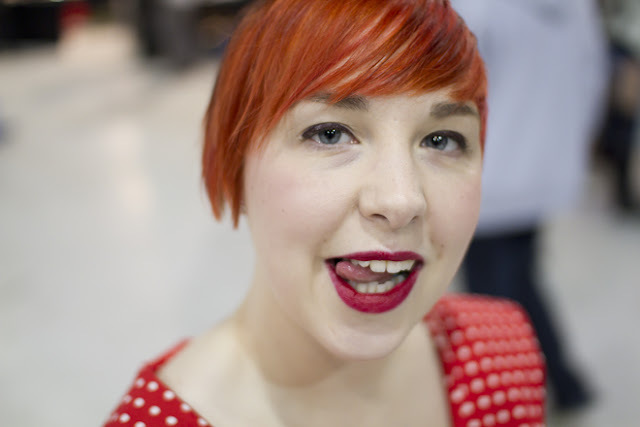 In the most delightful way: Tattoo Tea Party 2013. Two weekends ago, myself, hubby, the M-I-L and M-I-L BF (lol) all attended the 2013 Tattoo Tea Party. 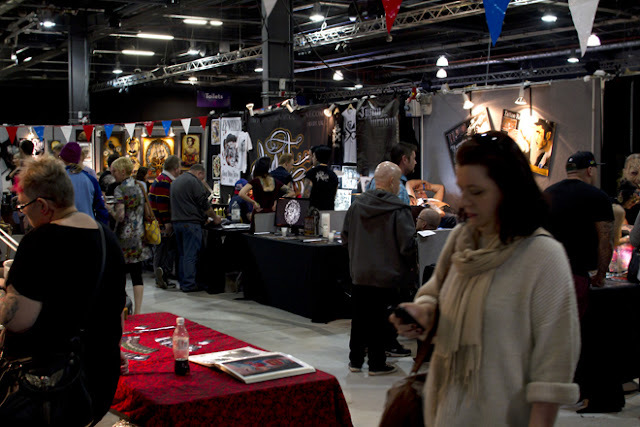 This is a tattoo convention that showcases what Britain and Ireland have to offer in the way of skin art and artists. To let you in on a little secret, me and hubby LOVE tattoos, and we have started a generous collection ourselves. This is our second tattoo convention and the second time we have been to the Tea Party. The first time, I found the artist that I am currently having some work done with, Jen Talloola Maw @ Nemesis Tattoo. She is amazing! Check her out. Also on our first trip hubby had some work done by Tom Ruki @ Tenacious Tattoo, which looks awesome. So this year we were ready to be amazed, and find some new artists to add their creativity to our collections. For those of you that have not been to a tattoo convention before, well you are missing out! It is definitely an experience, and not just one to be had by tattoo enthusiasts. If you like art in general you will be amazed, because not only do these guys draw, paint and sketch (like a conventional artist, so to speak), they then put this on someone's skin to be enjoyed for the rest of their life. And this is what one looks like. Not dissimilar to most other conventions, just more 'colourful' people. So what do you wear to such an occasion? Well anything you want really, but I decided to go for a retro feel. 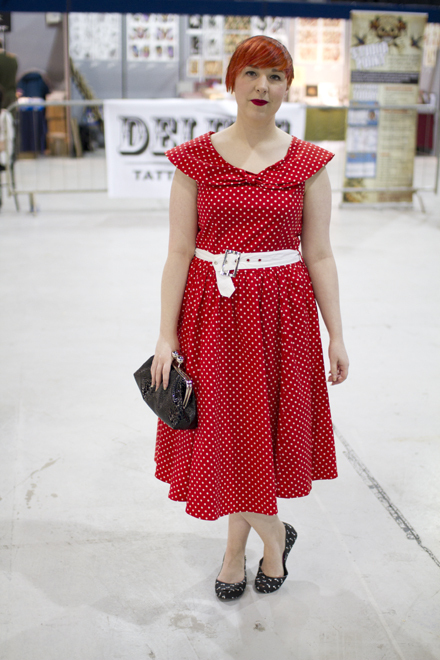 The dress I am wearing came from a stall at Katz Korner Vintage Swing @ The Printworks. Manchester. This is an annual, one day event showcasing dance, music, vintage fashion and vintage cars. This dress was £30 and I felt amazing wearing it. I teemed this with my Melissa Barbie shoes and a black clutch/across body bag (I have no idea where this was bought from). And look at those white arms, time for some artwork on those bad boys, me thinks. As you can see I also went a little 50s with the make-up. I can't remember exactly what make-up I used. I know, bad beauty blogger! But I do know for the lips I used Illamasqua Medium Pencil in Strumpet and Illamasqua lipstick in Box. 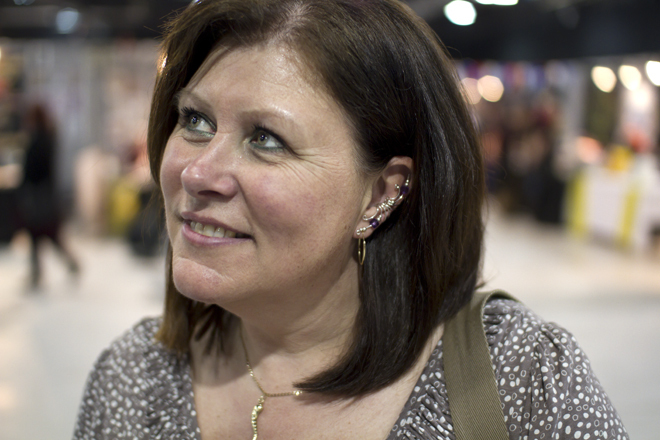 This is my lovely mother-in-law. It's her first outing on the blog so be kind, but I just couldn't pass up the opportunity to show you this lovely picture of her. And her new ear cuff. All in all we had a fab day. We bought a few things, cardigan for me, ear plugs (the earring kind) for hubby, and ear cuffs for M-I-L. We also saw some great artists and artwork (a lot of ladies being tattooed and tattooing this year. Hell Yeah!). Now I think it's time to get some more artwork done.